Are you interested in volunteering with the elderly? Have you ever wondered what People with Parkinson’s disease experience? If you say yes to either, then come join the Move to Beat Parkinson 2017 for an eventful morning of fun! Brighten up the beneficiaries’ day when you join them at Move to Beat Parkinson 2017, an annual event bringing together the Parkinson community with its interactive performances, games and gifts. Volunteers will interact with People with Parkinson’s disease from the local community, encourage them to participate in the activities and facilitate in moving them to the activity area. Ushers will be directing guests to the event venue in Toa Payoh Town Park and also guiding beneficiaries along the walk around the park. Most of the beneficiaries will be there with their caregivers. However, the varying degrees of mobility of the beneficiaries would mean they require assistance in getting around. Some People with Parkinson are prone to freezing spells (i.e. temporary, involuntary inability to move), which increases their risk of falls. You will be taught how to respond in such cases. Logistics volunteers will assist behind the scenes in making the whole event happen. 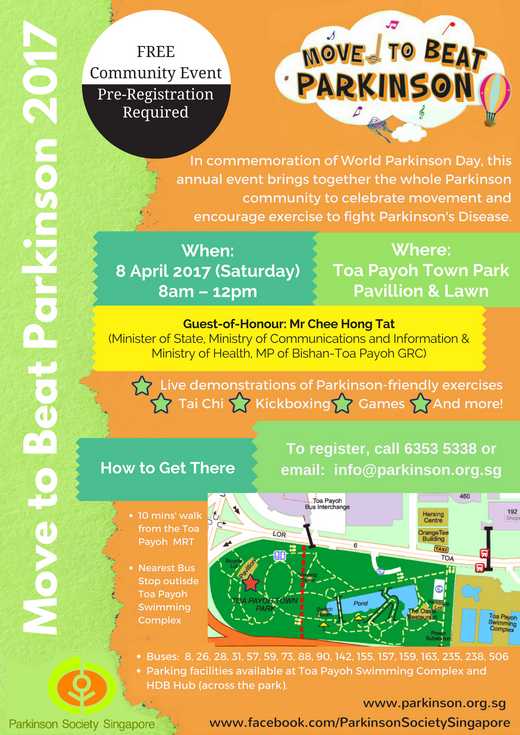 From helping to materialize the event layout to shifting different physical elements around, your role is essential in the very formation of Move to Beat Parkinson 2017. People with Parkinson and their caregivers come from all walks of life. Get to know their stories and find out more about these people beyond the Parkinson’s disease. Befrienders have to be on standby to provide assistance if necessary. Befrienders must be patient and enjoy interacting with the elderly. To facilitate better matching of befrienders to elderly, please indicate the languages you speak.